Australian building material developer ClearVue Technologies have had some good news this week – with their commercial solar windows passing the Australian Standard AS 2047, thus preparing them to market the products across Australia. We’ve written about the ClearVue integrated clear glass solar panel before – they’ve had a successful IPO, have updated their technology a couple times, and seem to be ready to really get started selling commercial solar windows to Australia and the overseas market. 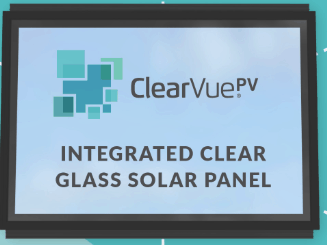 Clearvue’s BIPV (Building Integrated Photovoltaic) offering the implementation of solar technology into frame-independent Insulated Glass Units which will house the ClearVue integrated clear glass solar panel. Using industry standard frames means their tech will be easy to offer to commercial buildings Australia-wide. SmallCaps are reporting that ClearVue is separately undertaking AS 4284 certification-testing on its glass curtain wall product with results expected in August. In Europe, ClearVue has also started the process to receive CE Mark certification and allow its products to be sold in the EU. The results are expected to be received in August as well. Lastly, in America, ClearVue intends to commence US certification in the “next quarter” (Q4 2018). “The accreditation by the AWA of the ClearVue window product to AS 2047 represents a giant leap forward for the company. With this step, we have now moved from being a research company into a commercial operation and are now able to commercialise our product in the Australian market. We are on track with the business plan outlined in our Prospectus and look forward to being able to announce to the market similar certifications and accreditations shortly,” said Mr Rosenberg. ClearVue will be showing off its products and solar window technology at the Australian Window Association’s ‘Fenestration Australia 2018’ conference in Port Douglas, Queensland on September 19-20 2018. 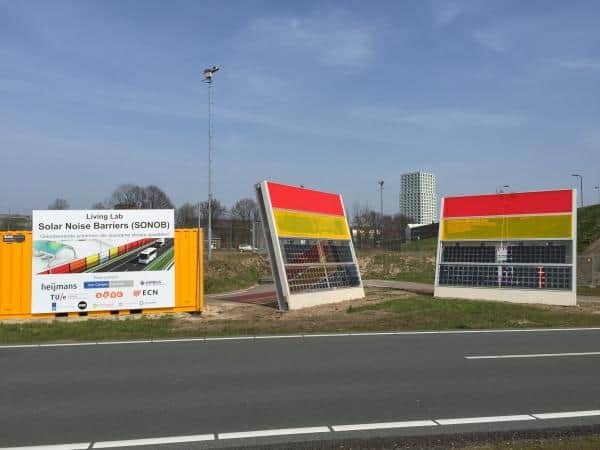 The Netherlands is expanding a test of solar panel sound barriers (SONOB) as part of a project replacing currently installed sound barriers. The usage of Infrastructure Integrated Photovoltaics (IIPV) (Also known as Building Integrated Photovoltaics (BIPV)) is being used in the Tesla Solar Roof, solar windows, and many more locations worldwide. Electrek are reporting that, following a successful 2014 trial in Hertogenbosch of the technology, a new project will commence construction early next year. They plan to connect to the grid later in 2018. The 68 discrete sound barriers will be five metres high and four metres wide along a 400 metre stretch of highway. This will make Solar Highways the largest project in Europe using integrated solar cells in noise barriers to generate power whilst also stopping noise pollution in the surrounding neighbourhood. The project will be undertaken by Heijmans in conjunction with Rijkswaterstaat (Ministry of Infrastructure and the Environment), Energy research Centre of the Netherlands (ECN) and the Solar Energy Application Centre (SEAC) – and the location of it is next to the A50 at Uden. Heijmans will be collaborating on the construction with Scheuten, Van Campen Bayards and Libra Energy. The 2014 project explored the efficiacy of two disparate methods – semi-transparent crystalline silicon-based solar noise barriers, and semi-transparent coloured plates which used solar concentrator technology. According to SEAC, after key learnings in the 2014 trials were utilised, a SONOB ‘living lab’ was installed in Den Bosch which adds extra functionality to improve soundproofing, scalability, noise barrier requirements, semi-transparency, and so on. The new barriers, facing north/south and east/west, are equipped with two Luminescent Solar Concentrators (LSC) with c-Si and GaAs cells and two panels with mono and bi-facial c-Si cells. The goal is to create a ‘breakthrough modular solar noise barrier concept’ that could be rolled out countrywide (and farther!). We’ll wait for results on this and also be sure to report on any new IIPV/BIPV installations coming up in the future to monitor how this exciting technology is progressing!